This is a special bonus extra post in my floating-point series, ranting about an issue that has been a problem for years. Some debuggers don’t display floats with enough precision. The debugger is plainly showing me that f1 and f2 have the same value, but it is also showing me that they are not equal. This seems confusing. Even though comparing floating-point numbers for equality is a a dark endeavor full of traps we should still expect that two floats (and they are both floats, see the ‘Type’ column) that contain the same value should be equal. An expert programmer knows that there are a few things that one can do in order to resolve this ambiguity. One can cast f1 and f2 to double in order to convince the debugger to print them using more digits, or one can display the underlying integer representation. With that done we see that f1 and f2 are indeed different numbers. Their floating-point values are slightly different, and their integer representations differ by one. It turns out that eight decimal digits of mantissa is not enough to reliably distinguish floats. You need nine. That may seem surprising. A float mantissa has 24 bits (if we include the implied one) which gives us 16,777,216 different mantissa values, which is representable in eight digits. However it turns out that if the first digit of the decimal mantissa is small enough, and if the stars align properly, then one extra decimal digit may be required. Numbers from 1,000 to just below 1,024 are perfect for this. It takes ten binary digits to represent the integer portion (four decimal digits) which leaves fourteen binary digits for the fractional portion. Fourteen binary digits is 16,384 different values. 16,384 different values clearly require five digits to uniquely identify, which means that nine decimal digits (4 + 5) are required to uniquely identify all float numbers in this range, and in fact nine decimal digits (for the mantissa) are sufficient to uniquely identify all float numbers. On the other hand, numbers from 1,024 to just below 10,000 only require eight decimal digits to uniquely identify. They use eleven or more binary digits for the integer portion, which leaves thirteen or fewer binary digits for the fraction. It’s important to be precise here: nine digits is not enough to fully display the precise value of all float numbers – that actually requires over a hundred digits in some cases (more on that later). However nine digits of mantissa is enough to unambiguously identify which of the ~4 billion floats we are talking about. This program took a bit less than half an hour to iterate through all 2 billion positive floats and it found 32,226,412 pairs of floats that require nine digit decimal mantissas to distinguish. In other words, roughly 6% of all floats need to be printed with a nine-digit mantissa. Visual Studio (versions 2005, 2010, and VS 11 Developer preview all behave identically) display floats with eight digits of precision, and this is insufficient. They need to display them with nine. They are sooo close. I am hopeful that this can be corrected before VS 11 ships. Finally. If printed in this manner you should get nine digits of mantissa and when you sscanf them back into memory you should get back the exact float that you started with. WinDbg gets this right. It displays floats with 10 digits of precision. 17 decimal digits of mantissa is how many is required to uniquely identify a double. 17 decimal digits of mantissa is the most that VC++ will print. If you ask VC++ to print more than 17 digits (printf(“%1.30e”, d1);) then the extra digits will all be zeroes, even though that is usually not the correct value. This is standards compliant, but annoying. We’ll deal with this problem, and explore how many digits it takes to perfectly represent the value of a float, in a subsequent post. 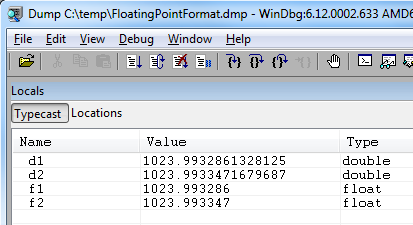 This entry was posted in Floating Point, Math, Programming and tagged debuggers, floating point, precision, visual studio, windbg. Bookmark the permalink. Bruce, great series on floating points and their nuances, enjoying them. Quick question: You mention about the integer representation of floating point in the post (they differ by 1in the watch window). What is this integer representation actually? Have you talked about this in any of your posts? The format was briefly discussed in the very first post (https://randomascii.wordpress.com/2012/01/11/tricks-with-the-floating-point-format/) and is alluded to in every other post. It is implicit in the Float_t and Double_t types. Right here is the perfect web site for everyone who hopes to find out about this topic. You realize a whole lot its almost hard to argue with you (not that I really will need to…HaHa). You definitely put a fresh spin on a topic that’s been written about for ages. Excellent stuff, just wonderful! Fixed. I put in the missing quote and convinced wordpress to not use smart quotes. Thanks. Would printf(“%1.8e”, &floatValue) & printf(“%.9g”, &floatValue) accomplish the same purpose? As long as nine digits of mantissa are printed you’re fine. %1.8e is one format that does that, but others are fine. It doesn’t matter whether it’s one digit in front of the decimal point and eight after, or nine after, or nine before (leading and trailing zeroes don’t count), as long as you have nine digits. You need 8 digits, but if you break 8 into two not integer halfs (3.5 and 4.5 for example), than you round up and get more digits as a result (4 and 5 in our example). Thanks for insightful articles. Opened my eyes on floats!